Broccoli is an excellent cool-season crop. It’s fairly easy to grow, providing even beginning gardeners with a source of fresh green veggies in spring and fall. Now that it’s March, we’re approaching harvest time. All that’s left is to head to the kitchen and cook a healthful, delicious meal for your family and friends using your garden produce. What can you do with your broccoli crop? When it comes to cooking, options are endless. 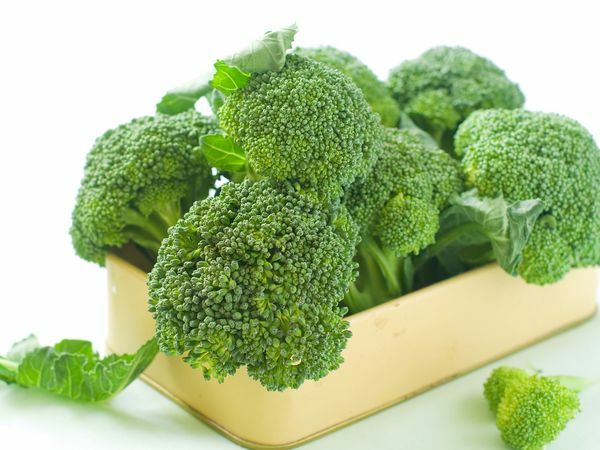 For a quick and savory side dish, try frying your broccoli heads in olive oil with crushed red pepper. We also love the flavor contrast of broccoli with lemon juice and minced garlic, roasted in the oven for about 20 minutes. Who knew getting your daily dose of vitamins could taste so good? If you’d like to use your broccoli to spruce up a fancier dish, the following recipe is our go-to: a broccoli & goat cheese soufflé. We love broccoli and we love goat cheese, so it only makes sense the two would mesh perfectly together. Ingredients in this recipe are pretty basic, so the delicious taste of broccoli isn’t overpowered. Give it a try and impress dinner guests with the versatility of your garden-grown veggies! 2. Microwave broccoli in a medium, microwave-safe bowl, covered, for 1-2 minutes. Set aside. 3. In a large skillet, melt butter and oil over medium-high heat. Whisk in flour and cook, whisking, for 1 minute. Adjust heat as needed to prevent the mixture from getting too dark; it should eventually be a shade of caramel. 4. Add milk, mustard, rosemary. Sprinkle on salt and cook, whisking constantly, until thickened, 1 to 2 minutes. 5. Remove saucepan from heat and immediately whisk in goat cheese and 3 egg yolks until well combined. Transfer mixture to a large bowl. 6. Using an electric mixer with a medium bowl, beat the five egg whites on high speed until soft peaks form. Add cream of tartar and continue beating until stiff peaks form. Next, fold half of the whipped whites into the milk mixture. Gently fold in the remaining egg whites and the reserved broccoli just until no white streaks remain. Transfer to the prepared dish(es). 7. Bake until puffed, firm to the touch and an instant-read thermometer inserted into the center registers 160°F, about 20 minutes in ramekins or 30 minutes in a soufflé dish. Serve immediately. Enjoy!